The hunt for the Majorana particle, a mysterious particle that is its own antiparticle, is still underway. In 2012, nanoscientists from Delft University of Technology, Eindhoven University of Technology and FOM found a particle that was very similar to the Majorana sought: 'it walks, talks and looks like a Majorana’. Further research must reveal whether their discovery is actually a Majorana particle. The Majorana's behaviour is closely linked to its unusual properties, or more to the point the lack of these. Particles which are the own antiparticles have no charge, are not magnetic and have no energy. If the Majorana did indeed have any of these characteristics then the particle and antiparticle would not be exactly the same. The first signs of the particle without properties were observed in 2012 by the Delft group in a nanowire linked to a superconductor. If these really are condensed-state Majoranas then these particles should satisfy non-abelian statistics. This means that the particles are non-commutative: if you rotate the particles to the left you will obtain a different result than if you had rotated them to the right. So the ultimate proof that the particle discovered is a Majorana will only be obtained if you can shift more particles and therefore test this characteristic. Nanowire junctions are needed for that movement of the particles. The non-abelian behaviour makes these particles suitable for use in future quantum computers. A nanowire junction can serve as a building block for such a computer: a 'qubit' that can be '0' and '1' at the same time. In 2013 the Leiden University group of Carlo Beenakker formulated a recipe for such a qubit. According to that recipe you need two nanowire junctions: two 'X's. In a recent article the group of Erik Bakkers from Eindhoven University of Technology demonstrated a method to produce such junctions. The 'Xs' are a single crystal line made up of indium-antimony, which is ideally suited for forming Majorana particles in. The initial transport measurements show that the quality of the wires is excellent. 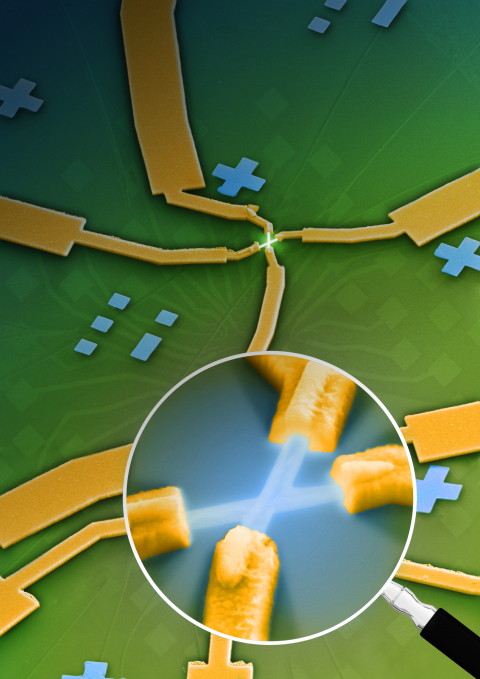 A supercurrent can even pass through the junctions – a vital element for forming Majorana particles. This is an important step in the hunt for the mysterious particle. An electron microscopy image of a nanowire junction on which electrical contacts have been made. In the future such a junction can be used to exchange the position of Majorana particles. This exchange of position is an important step towards understanding the characteristics of Majorana particles.